Re: Shadow’s Spooktacular Halloween Showcase!! Round 6 (Finale!) DUE 10/29! STORY counts for HALF! 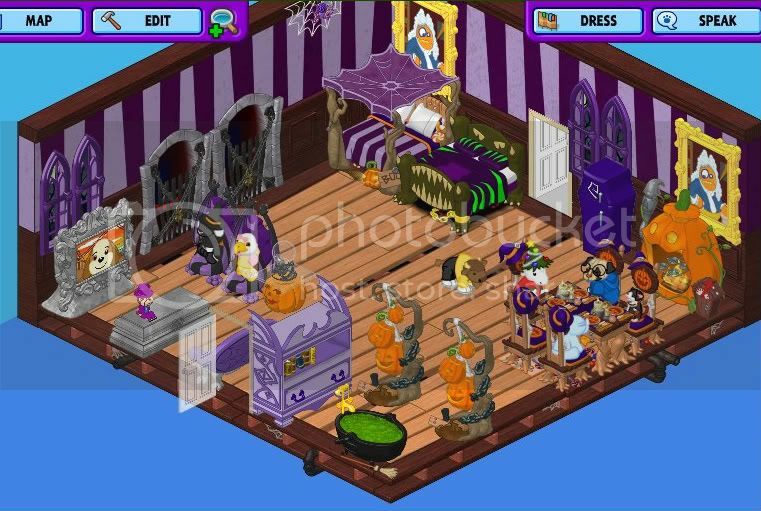 Come on in and share your Halloween Rooms! WINNERS posted: Rounds 1 thru 5! "The pumpkin harvest is ready! The pumpkin harvest is ready!" Severus flew shouting through the streets of Kinzville. "Come on out to my pumpkin patch and help me welcome in the Great Pumpkin!" Severus's best friend, Shadow, the black cat, was the first to arrive, dressed in her favorite witch outfit with white Hollywood shades. Junior, the cheeky monkey, and Matilda the monkey were the next to arrive. Junior chose a cowboy costume, while Matilda dressed as a ballet princess. Tetley, the elephant, stopped by in his favorite wizard outfit. Lil' St. Bernard, Professor Higgins, and Lil' Gold and White Cat, Sir Henry Morgan, are dressed as Autumn Leaves in their Fallfest clothes. Hobbes the tiger is dressed as a bumble bee. Splash is wearing her trademark chef outfit. Salty is wearing her pirate outfit, complete with Webkinz Crown of Wonder. Wonder when the great pumpkin will show? “Was that a raindrop I felt?” Tetley wondered out loud. “I felt one, too,” confirmed Splash. “I heard that hurricane Ichabod was passing through our area,” reported Professor Higgins. Just then, the sky turned even blacker than black, as the moon disappeared behind the storm clouds, and rain began to pour on our little pumpkin partiers. “We’d better get inside before we all catch a frightful cold!” proclaimed Shadow. We can dry off in the purple parlor, and still look out the windows for the Great Pumpkin. And so our little group of pumpkin watchers retired to the purple parlor, where they took turns looking out the windows into the pumpkin patch to make sure they wouldn’t miss the arrival of the “Great One”. “Tell us a Ghost Story, Shadow!” begged Hobbes. “I just LOVE your stories!” “Yes, Shadow! PLEASE!” echoed Matilda. “Okay,” began Shadow. “Once upon a time in Kinzville, there lived a Raven, named Edgar A. Crow… Edgar lived in an old abandoned house at the top of the hill… "
“Sorry to interrupt your marvelous monologue, Shadow, but is anyone else feeling frightfully famished?” Professor Higgins inquired. The little band of costume-clad friends paraded into the Grille for a midnight snack. As Splash busied herself in the kitchen, preparing an elaborate spread, Shadow entertained them with tunes on the piano. After a few songs, Salty started to notice the tempo was slowing, and the chords were sounding a bit, - well, sad. “Is everything okay, Shadow?” she inquired. “What do you do when you’re sad for something to end, Salty?” Shadow asked of her big sister. Stay tuned for Chapter 6 . . .
Also, don't forget the Haunted Theme items go away after tomorrow! Who will be next to post? Last edited by SaltyMac; 10-28-2008 at 10:36 PM.. Thanks for checking in, Puppylove! Okay here is my gang getting ready for their first year of trick or treating! Lorahlie and liberty bell have finished dinner and are watching tv while they wait for their friends to finish. Everyone has decided that from this Halloween forward they will eat tomato soup and cornbread for dinner. (a Halloween tradition to pass down for years!) of course they will all have their new chef G recipe, pecan pie, for desert! Audrey, Sir Reginald, Pupcake, and Mr. Monk are finishing up, while Sid checks up on everyone. (He’s ready to go!) When the night is over everyone will meet back at Mr. Monk and Pupcakes room to share all the yummy surprises and talk about their favorite part of the evening!! Thanks for posting, 248keri! Great entry! Oh how FUN: a Halloween dinner tradition! And we love the way you tied it back to your earlier entry with the pecan pie! hey how do you get the picture big salty? if you can't tell me, is there a thread i can brush up on? thank you for always making my pic big for me! Last edited by 248keri; 10-28-2008 at 09:03 PM..
Now your probably wondering where Salsa went? Well she misteriously disapeared into the dungeon and captain who was supposed to come got sick and is staying home in bed! Boo Hoo! Of course Sheila is trying to figure out the new secret recipe but she is doing it here because she ran out of food. Shadow the chef made mummy wraps (hot dog weenies) and goblins soup. Dinner changed from earlier because Salsa was allergic to the mummy wraps. Now we are off to trick-or-treating! i'll post so i can read chaper 2! i'm sorry did you want another picture up? i all ready have mine up, so i guess i'll wait for another post! Last edited by 248keri; 10-28-2008 at 09:09 PM.. I see you're already using Photobucket. In photobucket, under the picture, the last code is the IMG code. That's the one you want to paste into your entry. There is a how-to guide here on WI. I had it in the first post till tonight, but I just deleted it to make room for winners thread. Hold on - I'll see if I can find, and post back here. Mmmmm! Yummy Mummy Wraps!! Our favorite!! Can't wait for chapter 2! OMG i am really trying to work hard and get it done not a lot of computer time the last couple of days i hope i get it done in time! What if I can't get it done in time?